The sea around New Zealand is abundant with fish and shellfish. 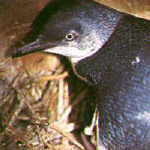 There are also numerous sea birds, some of which are native to New Zealand. There are also numerous lakes, rivers and streams which are a fresh water angler's paradise. New Zealand is a paradise for fishermen of all ages and fishing is one of the most popular pastimes of New Zealanders. 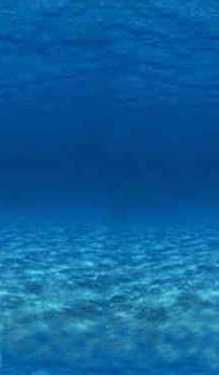 The sea is host to numerous species of fish and shellfish. Seafood is a major food source in New Zealand and is popular with most of the population. The most popular fish for eating are the snapper, gurnard, red cod, blue cod, flounder and hoki. The red and blue cod are mainly caught around the South Island. The snapper is most prolific in the Hauraki Gulf mainly because it is their spawning ground. Gurnard can be caught mainly on the East Coast. Flounder is mainly fished at low tide on mud flats in estuaries. 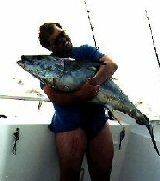 Deep sea fishing is also a major past time. The quarries being striped marlin, tuna, kingfish and, of course, sharks. 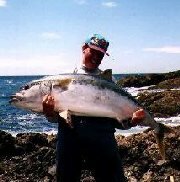 Below are some pictures of some of the species of salt water fish abundant in New Zealand waters. This fish has quite and oily flesh and is not eaten by most fishermen, but it does make a lovely fish pie. A deep water fish found mainly around rocks. Nice eating but mainly used for bait. The crayfish has been drastically overfished in New Zealand and is now a delicacy. Shellfish is also abundant in New Zealand waters and on the beaches. The Toheroa is now rare enough for there only to be a few days a year when they can be fished at 90 Mile Beach. The Toheroa grows up to 170mm in length, but in the past has been found 300mm long. Scallops, oysters, kina (sea egg) are all sought after. Oysters are farmed in the Bluff (the bottom of the South Island) on a season basis. Below are some pictures of some of the shellfish available in New Zealand. These are green lipped mussels which are farmed for the home and export market. Blue mussels are smaller and can be found growing beyond the tidal mark on rocks. The tuatua is a smaller version of a toheroa and grows up to 60mm in length. It is found on the ocean beach and is fished when the tide is out. 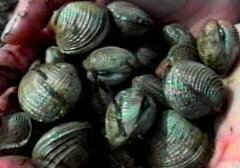 The pipi is found in sheltered harbours and estuaries on sandbanks and like the tuatua is fished for when the tide is out. Cockles grow up to 30mm in length and can be found in harbours, estuary tidal flats and sheltered coastal sandbanks. The Paua is a shellfish that likes deep water. It has black leathery flesh, which needs to be pounded before cooking. The shell is polished and used for jewellery. New Zealand's lakes, rivers and streams are abundant with brown and rainbow trout. Trout fishing in New Zealand is governed by seasons and various districts and it is mandatory to have a fishing licence to fish in the lakes, rivers and streams in the districts. Below are a few pics of the freshwater fish available in New Zealand. The kokopu is a rare native trout. It is mostly nocturnal but can be seen basking in the sun during the day. It is the largest of the whitebait species. The brown trout grows to a large size and likes the deep water. The salmon was introduced to New Zealand in the early 1900's and is only found in the South Island. This threatened sea lion once bred all around New Zealand but now mainly breeds on the subantarctic islands. Small colonies can still be seen in Otago in the South Island. The males grow to 400 kg and the females to 180kg. The hectors Dolphin is the world's smallest dolphin and is only found in New Zealand waters. There are two other types of dolphins that are found in New Zealand waters, the bottlenose and the dusky. The bottlenose is common throughout the surrounding waters and it is not uncommon for them to play close to any boat. 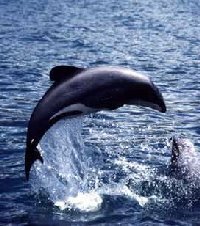 The dusky dolphin is a bit of a shy wee thing and there is a major exercise in New Zealand to increase their numbers. New Zealand is visited by numerous types of whales, eg the sperm, humpback and killer whales. Whale watching is a major tourist attraction off the coast of Kaikoura (South Island). Also seen are dolphins and fur seals and numerous sea birds. The smallest of the petrels that is mainly seen at sea around the South Island. This bird is the largest of the petrels and is mainly seen on the Chatham Islands. and around the South Island. This bird is seen on most beaches. 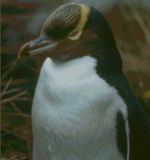 This endangered bird prefers the coastal forest in Otago in the South Island. This little bird is found in and around the north of the North Island and in the South Island. 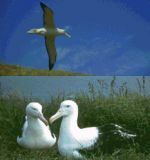 The albatross colonies in Otago are a great tourist attraction. Yes, one of the most common sea birds that can be seen anywhere in the world, but I felt that they had to be included in this page even though they are regarded as scavengers, they are a beautiful bird. This is a tall, slim bird with a white face as its name suggests. It introduced itself to New Zealand around the middle of the century and is commonly seen on rocks on the seashore and in river estuaries. 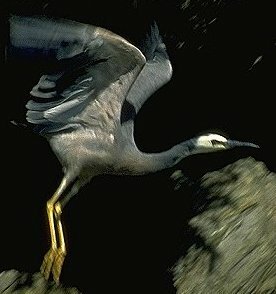 I have only shown a few of the sea birds that can be found in and around New Zealand. Some of the others are oyster catchers, gannets (the gannet colony at Cape Kidnappers is a major tourist attraction), shags, to name a few more.